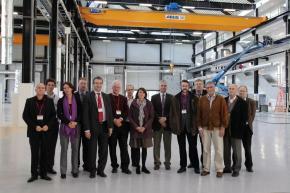 Leading nuclear researchers from across Europe visited the Nuclear AMRC as part of a tour of key UK reserch facilities. During their visit to the Nuclear AMRC, the group heard about the centre’s operations and how it works with companies along the civil nuclear supply chain. Operations director Steve Court explained the centre’s work in manufacturing process R&D and support in training, quality and business development. The Nuclear AMRC is focused on supporting the UK nuclear manufacturing sector, but works with institutions and companies across Europe on collaborative research projects addressing major industry issues. The visitors also heard Professor Neil Hyatt of the University of Sheffield’s Immobilisation Science Laboratory (ISL) talk about other world-leading nuclear research in Sheffield. 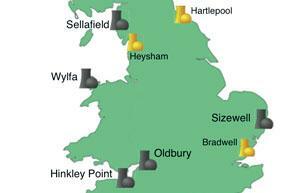 The ISL is the UK’s largest research group focusing purely on nuclear waste management. It is developing innovative technologies in areas such as large-scale vitrification of waste, and remediation of land contaminated by depleted uranium munitions. Hyatt also introduced the Nuclear FIRST doctoral training centre, a collaboration between the Universities of Sheffield and Manchester. The party were then given a tour of the Nuclear AMRC’s new facility at the Advanced Manufacturing Park in South Yorkshire, and a demonstration of virtual reality technology used for design, simulation and training. The four-day tour also included a visit to the new Nuclear AMRC Laboratory at the Dalton Nuclear Institute in Manchester, plus the new Dalton Cumbrian Facility and the National Nuclear Laboratory in Sellafield, and Imperial College London. The tour provided an overview of the nuclear sector and research community in the UK, with a focus on developing contacts to help UK and European researchers work together on collaborative projects. The UK Science and Innovation Network is jointly funded by the Foreign and Commonwealth Office (FCO) and the Department for Business, Innovation and Skills (BIS). This tour is part of a series of events organised by the Science and Innovation team in Berne (Switzerland) in support of the British Government’s commitment to nuclear energy as a key component in delivering the UK’s low carbon economy. Research involving the Nuclear AMRC’s innovative robotic machining cell has been presented at a high-profile engineering conference in Toulouse, France. Speaking at the prestigious SAE AeroTech Congress, Roger Holden of Nikon Metrology presented progress on the project jointly led by Dave Stoddart, robotics project manager at the Nuclear AMRC. The robot cell has now been installed in the Nuclear AMRC’s research factory in South Yorkshire, following initial trials at Nikon Metrology’s workshop in Tamworth. The project aims to develop a single automated system which can carry out a range of processes such as machining, welding, dressing and inspection over a large area to very high precisions. “Traditionally, the manufacture of very large components involves very large machines, and you spend a huge amount of time moving the components between various machines and processes,” explains Stoddart. “The principle behind robot machining is simple – it’s a lot more efficient, cost-effective and safe to bring the machines and processes to the component. The robot cell provided by Nikon Metrology is based around a hexapod robot from Fanuc Robotics which can carry a variety of tool heads. The robot’s position is tracked by an indoor GPS system. In trials, accuracies of 0.2mm have been achieved. Although the Nuclear AMRC project is focused on nuclear manufacturing applications, robotic machining technology is also the subject of intense interest from the aerospace industry. Nuclear AMRC machining group manager Stuart Dawson also presented the research at the MWP Advanced Manufacturing Summit in November 2011. The video below was edited from footage prepared for his presentation, and shows the flexibility and accuracy of movement of the robotic system. UK nuclear developers have committed to act on the recommendations of the final Weightman report on lessons from the Fukushima crisis. Mike Weightman, the UK’s chief inspector of nuclear installations, last week delivered his final report highlighting 38 areas where government, industry and regulators can learn lessons from the Japanese experience. Weightman concluded that an analysis of the Fukushima Dai-ichi accident revealed no fundamental safety weaknesses in the UK’s nuclear industry, but that the industry can be made even safer. The report expands on the interim report released in May, which found 25 areas for review. Weightman said: “I remain confident that our UK nuclear facilities have no fundamental safety weaknesses. The Office for Nuclear Regulation already requires protection of nuclear sites against the worst-case scenarios that are predictable for the UK. But we are not complacent. Our philosophy is one of continuous improvement. No matter how high our standards, the quest for improvement must never stop. 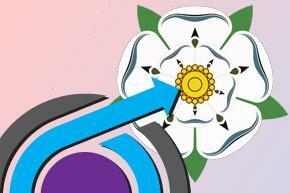 The groups planning new nuclear plant in the UK welcomed the report. EDF Energy chief executive Vincent de Rivaz said: “We will review his findings in detail and build them into our plans. We have already committed to implementing his recommendations for us in full. Alan Raymant, chief operating officer of Horizon Nuclear Power, also welcomed Weightman’s findings. 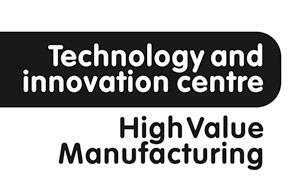 The new Technology & Innovation Centre (TIC) for High Value Manufacturing has officially opened for business. The TIC is a consortium of seven established manufacturing research centres, including the Nuclear AMRC, with the mission of stimulating UK manufacturing and reducing the risk of innovation for new and established businesses. The Technology Strategy Board (TSB) is investing £140 million over six years in the new centre. The funding will allow the individual centres to expand their own facilities and resources, and create a national network capable of addressing high-value sectors from pharmaceuticals to power generation. Business secretary Vince Cable MP declared the TIC open at the TSB’s Innovate ’11 conference in London in October. The Nuclear AMRC is launching a new programme to help manufacturing SMEs in the Yorkshire & Humber region access the opportunities of the nuclear industry. The Nuclear Supply Opportunities for Yorkshire programme is based around a one-day workshop designed to give SMEs the information they need to make the strategic decision on whether to pursue opportunities in the sector. The first workshop was held in October, with further workshops taking place each month. The workshop includes a one-to-one Nuclear Diagnostic Assessment to let companies measure their performance against the standards required by the industry leaders. Participants can then arrange a site visit and full business review by one of our nuclear and manufacturing experts. The Nuclear AMRC and Manufacturing Advisory Service present a workshop for companies which are interested in entering the supply chain for nuclear new-build, but which have limited experience in nuclear manufacturing. The half-day workshop, delivered by Parsons Brinckerhoff, introduces the quality demands of nuclear manufacturing, and describe the roles and responsibilities of manufacturers. The workshop focuses on what Inspection Agencies look for when assessing a nuclear manufacturer. Independent third-party inspectors are typically commissioned by the utilities buying new nuclear plant, to ensure that their suppliers conform to industry specifications. The inspectors are charged with assessing suppliers against contractual requirements and industry standards for the production of equipment for new nuclear power plant. Attendance is free to representatives of interested UK manufacturing companies, but places are limited. Following a successful workshop in December, further events will be held around the UK in 2012. For more information, download the flyer or contact Nuclear AMRC head of quality Paul Bunting.